A tropical wedding theme is not complete without fragrant tropical flowers and lush foliage. Tropical themes include the exotic South Seas, elegant beach locals, and destination weddings in Hawaii and other exotic locations. Tropical flowers set the stage for any tropical wedding theme. The flowers you choose will depend on your specific wedding theme, wedding location, as well as your wedding theme colors. Tropical wedding flowers range from simple and elegant single flower bouquets to extravagantly beautiful reception centerpiece arrangements. Combinations of vibrant flowers and exotic foliage are essential components for any tropical wedding theme. Striking Bird of Paradise - Bird of paradise flowers resemble an exotic bird’s beak with a spray of brilliant orange sepals and midnight blue petals as head plumage. These striking flowers can be used in wedding bouquets and centerpiece arrangements. Elegant Orchids – Orchid flowers grow from a stiff, slender stalk. Orchid flowers are composed of three inner petals, three outer petals, and a cupped petal distinct from the rest. These elegant, durable flowers are a popular choice for bouquets, boutonnieres, corsages, Hawaiian leis, and table arrangements. Heart-Shaped Anthurium – Anthurium plants are known for their brightly colored flower bracts (spathes) that come in various shades of red, white, pink, orange, and green. Anthuriums are an ideal wedding flower for bouquets and centerpieces due to their unique heart-shaped flower bracts. Fragrant Plumeria - Plumeria flowers (also called frangipani flowers) are intensely fragrant. They consist of five petals that form beautiful pinwheel shaped blooms. Plumeria flower colors include white, yellow, red, pink, or a combination. Fragrant plumeria are a favorite choice for wedding leis and bouquets. Colorful Hibiscus – Hibiscus flowers come in a wide range of flower colors including red, yellow, orange, pick, purple, and blue. Their blooms consist of five petals, with a range in diameter of four to eight inches. Hibiscus flowers typically bloom for only one day; therefore they are best used for wedding ceremonies in locations where they grow in abundance. Exotic Heliconia – The Heliconia Rostrata (also called Lobster Claw) is a beautiful architectural plant with vibrant colors typically used in centerpieces. The flowers hang in showy clusters that emerge from stiff stalks. Textured Ginger – Ginger flowers are textured blooms, resembling red pine cones growing from ten inch tall evergreen stalks. These flowers are a tropical favorite used in floral arrangements. 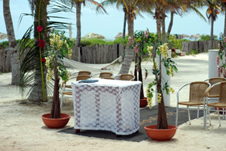 A Hawaiian wedding theme incorporates culture and traditions into your ceremony and celebration. Tropical flowers will add fragrant beauty and symbolic meaning to the wedding ceremony and reception of this tropical wedding theme. Circle of Love – Symbolizes the eternity of everlasting love. 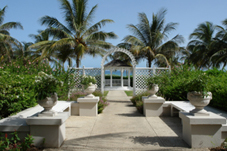 Close family and friends can participate by individually placing tropical wedding flowers on the ground to form a circle. The bride and groom stand in the center of a circle of tropical flowers during the wedding ceremony. A Lei Exchange – The bride and groom exchange leis at the beginning of the wedding ceremony as a symbol of love, respect, and commitment. Leis can be worn by the wedding party as well. Binding the Bride’s and Groom’s Hands Together – In a traditional Hawaiian ceremony, the Kahuna Pule (holy man) binds the hands of the bride and groom together with a Maile Lei. Meile leis are typically worn by the groom and groomsmen. Consider Presenting Leis - Present leis to the in-laws of the bride and groom as a symbol of respect and gratitude, as well as to celebrate the union of two families. Leis can also be presented to guests at the reception. Traditional Lei - A flower or leafy closed garland worn around the neck and, given as a gift, is a traditional way of showing love, respect, and gratitude. Leis make an unforgettable wedding favor. With proper care, they will last long after your wedding day. Tropical flower leis for your guests are an excellent addition to your tropical themed wedding. Haku – A head lei composed of intricately woven flowers, vines, and foliage that is worn by the bride. The bride may also choose to wear wrist and/or ankle leis. Maile Leis – This is an open-ended lei made of scented green maile stems and leaves. The maile lei signifies honor and respect, and is typically worn by the groom.